Hussain Mir, S., Maqbool Darzi, M., Saleem Mir, M. (2013). Efficacy of Abroma augusta on Biochemical and Histomorphological Features of Alloxan-Induced Diabetic Rabbits. Iranian Journal of Pathology, 8(3), 153-158. Sajad Hussain Mir; Mohammad Maqbool Darzi; Masood Saleem Mir. "Efficacy of Abroma augusta on Biochemical and Histomorphological Features of Alloxan-Induced Diabetic Rabbits". 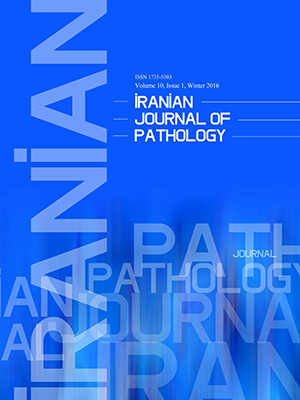 Iranian Journal of Pathology, 8, 3, 2013, 153-158. Hussain Mir, S., Maqbool Darzi, M., Saleem Mir, M. (2013). 'Efficacy of Abroma augusta on Biochemical and Histomorphological Features of Alloxan-Induced Diabetic Rabbits', Iranian Journal of Pathology, 8(3), pp. 153-158. Hussain Mir, S., Maqbool Darzi, M., Saleem Mir, M. Efficacy of Abroma augusta on Biochemical and Histomorphological Features of Alloxan-Induced Diabetic Rabbits. Iranian Journal of Pathology, 2013; 8(3): 153-158. Background and Objectives: Medicinal plants are well documented for possessing antidiabetic or antihyperglycaemic potential. Abroma augusta seems to have the same effect in treating diabetes mellitus. The aim of the present experiment was to report the efficacy of the aqueous extract of the leaves of A. augusta on biochemical and histological abnormalities of alloxan-induced diabetic rabbits. Materials and Methods: An experiment was conducted to study the effect of aqueous extract of the leaves of A. augusta on biochemical values and histomorphological features of pancreas and kidneys of alloxan-induced (@ 80 mg/kg. body weight intraperitoneally) diabetic rabbits. The animals were divided into three groups viz, normal control, diabetic control and A. augusta treated diabetic rabbits. The extract was given by gavages at a dose of 2ml/kg body weight twice daily for a period of 21 days. Result: Normal blood sugar (P<0.01), blood urea (P<0.01) and serum creatinine (P<0.02) levels were observed. Histological examination of the pancreas showed an increase in the number of beta cells in the A. augusta treated diabetic rabbits. Further, the extract was found to ameliorate the histological abnormalities of the kidneys in diabetic rabbits. Conclusion: This experimental study indicates that A. augusta extract possess either antioxidant effect or regenerative ability in ameliorating the biochemical and histomorphological abnormalities in diabetic rabbits. Satyavati GV, Gupta A, Tandon N. Medicinal plants of India. New Delhi:Indian Coun Med Res;1987. Bailey CJ, Day C. Traditional plant medicines as treatments for diabetes. Diabetes Care 1989;12(8): 553-64. Marles FJ, Farnsworth NR. Antidiabetic plants and their active constituents: an update. Protocol J Nat Med Winter 1996:85-111. Das Gupta B, Basu K. Chemical investigation of Abroma angusta Linn- Identity of abramine with betaine. Experientia 1970;26:477. Mukherjee KS, Shah Badruddoja. Chemical investigation of bark of Abroma augusta Linn. J Indian Chem Soc 1977;54:647. Gupta B, Nayak S, Solanki S. Abroma augusta linn f: A review. Der Pharma Sinica 2011;2(4):253-61. Waguri M, Yamamoto K, Miyagawa JI, Tochino Y, Yamamori K, Kajimoto Y, et al.Demonstration of two different processes of beta cells regeneration in a new diabetic mouse model induced by selective perfusion of alloxan. Diabetes 1997;46(8):1281-90. Anonymous. Guidelines for care and use of animals in scientific research. New Delhi:Indian National Scientific Academy;2000. Rastogi DP, Singh DM, Kumar S. Elucidation of therapeutic efficacy of potentised microdoses of homoeopathic drugs: An experimental approach with alloxan as model vis-a-vis its antidiabetic activity. Hom Herit1998;23:83-8. Baqui A, Mir Sajad Hussain, Darzi MM, Saleem MM. Biochemical and therapeutic studies on the alloxan-induced diabetes mellitus in rabbits. Oriental Sci 2005;10:63-8. Islam T, Rahman A, Islam AU. Effects of Aqueous extract of fresh leaves of Abroma augusta L. on oral absorption of glucose and metformin hydrochloride in experimental rats. ISRN Pharm. 2012;2012:472586. doi: 10.5402/2012/472586. Luna Lee G. Manual of Histologic Staining Methods of the Armed Forces Institute of Pathology. 3rd ed. New York :McGraw-Hill Book Company;1968. Halami NS. Differentiation of two types of basophils in the adenohypophysis of the rat and mouse. Stain Technol 1952;27:61-4. Hussain MS, Darzi MM. Histopathological abnormalities of prolonged alloxan-induced diabetes mellitus in rabbits. Int J Exp Pathol 2009;90:66-73. Prasad S. Fundamentals of Biostatistics (Biometry). Delhi: EMKAY Publications;2000. Keen H, NgTang FS. The definition and classification of diabetes mellitus. Clin Endocrinol Metab 1982;11:279-305. Dunn JS, Sheehan HL, McLetchie NGB. Necrosis of islets of Langerhan’s produced experimentally. Lancet1943;1:484. Lukenes FDW. Alloxan diabetes. Physiological Rev1948;28:304-30. Fischer LJ, Harman AW. In pathology of oxygen. New York: Academic Press;1982. Grodsky GM, Gerold AE, Carol CL, Douglas CE, John GC, George HT, et al. Metabolic and underlying causes of diabetes mellitus. Diabetes1982;31:45-53. Habib MY, Islam MS, Awal MA, Khan MA. Herbal products: A noval approach for diabetic patients. Pakistan J Nutr 2005;4(1):17-21. Halim Eshrat M. Lowering of blood sugar by water extract of Azadiracta indica and Abroma augusta in diabetic rats. Indian J Exper Biol 2003;41:636-40. Collier E, Watkinson A, Cleland CF, Roth J. Partial purification and characterization of an insulin-like material from spinach and gibba G3. J Biol Chem 1987;262:6238-47. Bhide MB, Aiman R. Mechanism of action of oral antidiabetic drugs. Indian J Med Res 1963;51: 733. Shanmugasundaram ER, Gopith KI, Radha SK, Rajendran VM. Possible regeneration of the islets of Langerhan’s in streptozotocin-diabetic rats given gymnema sylvestere leaf extract. J Ethnopharmacol 1990;30:265-69. Abdel MA, EL-Feki M, Salah E. Effect of Nigella sativa, fish oil andgliclazide on alloxan diabetic rats. 1-Biochemical and histopathological studies. J Egyptian Ger Soci Zool 1997;23: 237-65. Meir P, Yaniv Z. An in vitro study on the effect of Momordica charantica on glucose uptake and glucose metabolism in rats. Plant Med 1985;1:12-8. Chakravarthy BK, Gupta S, Gambhir SS, Gode KD. Pancreatic beta cell regeneration- A novel antidiabetic mechanism of Pterocarpus marsupium, Roxb. Indian J Pharmacol1980; 12(2):123-7. Slack JM. Developmental biology of the pancreas. Development 1995;121:1569-80. Jindal RM, Sidner RA, Cummings O, Miller GA, Filo RS. Proliferation of rat pancreatic ductal-epithelial cells in vitro and in response to partial hepatectomy and pancreatectomy in vivo. Transplantation Proc 1995;27:2991-2. Hellerstrom C. The life story of the pancreatic b-cell. Diabetologia 1984;26:393-400. Bonner-Weir S, Baxter LA, Schuppin GT, Smith FE. A second pathway for regeneration of adult exocrine and endocrine pancreas. A possible recapitulation of embryonic development. Diabetes 1993; 42:1715-20. Lipsett M, Finegood DT. Beta-cell neogenesis during prolonged hyperglycemia in rats. Diabetes 2002; 51(6):1834-41. SchosslerDRC, Mazzanti CM, da Luz SCA, Filappi A, Prestes D, Ferreira da Silveira A, et al. Syzygium cumini and the regeneration of insulin positive cells from the pancreatic duct. Brazilian J Vet Res An Sci 2004;41: 236-9. Tedong L, Dimo T, Dzeufiet PDD, Asongalem AE, Sokeng DS, Callard P, et al. Antihyperglycemic and renal protective activities of Anacardium occidentale (Anacardiaceae) leaves in streptozotocin induced diabetic rats. African J Trad CAM 2006;3(1):23-35. Kissane JM. Anderson’s Pathology. 8th ed. Toronto:Washington University School of Medicine. 1985. Nahar L, Ripa FA, Zulfiker AH, Rokonuzzaman MD, Haque M, Islam KMS. Comparative study of antidiabetic effect of Abroma augusta and Syzygium cumini on alloxan induced diabetic rat. Agr Biol J North Am 2010;1(6)1268-72. Floretto P, Steffes MW, Sutherland ERD, Goetz CF, Mauer M. Reversal of lesions of diabetic nephropathy after pancreas transplantation. N Eng J Med 1998;339:69-75. Renu A, Saiyada NA, Odenbach S. Effect of reinstitution of good metabolic control on oxidative stress in kidney of diabetic rats. J Diabetes Compl 2004;5:282-8.